The Bruins faced a tough test tonight in the Central division leading St. Louis Blues. Patrice Bergeron started the scoring less than six minutes into the game getting a gift from Ian Cole and making him pay for it. Boston gave the league's second best power-play a couple chances in the first, but the Blues were not able to capitalize. Milan Lucic nearly buried another goal, but was not able to get a full swing on the puck after Blues' goalie Brian Elliot made the initial save. The second period saw St. Louis come out very strong. The Blues dominated the puck possession and forced Tuukka Rask to make some difficult saves. The Bruins survived the onslaught and had some strong chances they were not able to finish. However, after some sustained pressure in the St. Louis zone, Torey Krug added to the Bruins lead nearly twelve minutes into the period with a shot from the point off Ian Cole. Cole did not have much puck luck tonight. 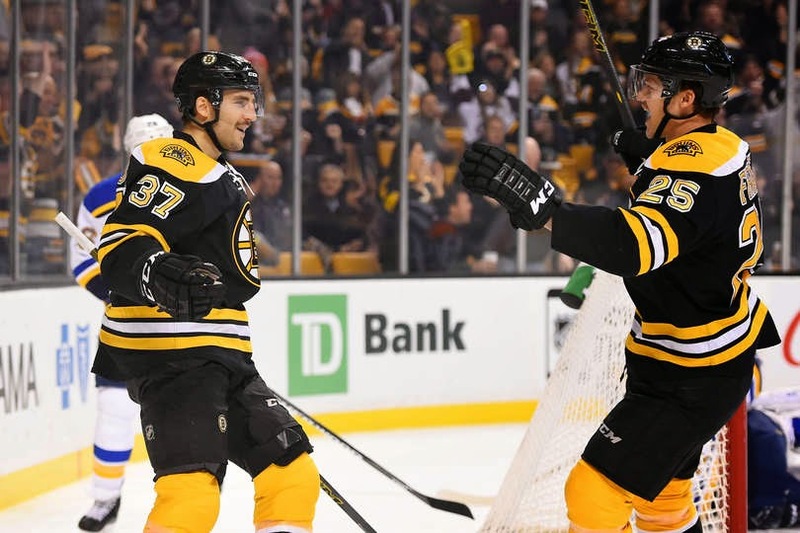 Matt Bartkowski picked up the main assist on Krug's goal, which was also his first point of his season. With less than ten seconds left, Matt Fraser appeared to make it 3-0, but a controversial goalie interference call wiped it off the board. The third period started evenly with both teams getting quality scoring chances. The Blues began to take over in the middle of the period, but Tuukka Rask kept his team in the lead with save after save. St. Louis continued to put the pressure on Boston and severely out-shot the Bruins in the third. Ken Hitchcock elected to pull Brian Elliot with three minutes left, but a hooking call on Paul Statsny gave Boston a power-play for nearly the rest of the game. Rask stood tall at the end and Boston earned a big win. The Bruins played more than half of the game without veteran defenseman Adam McQuaid. McQuaid left the game with an undisclosed injury after blocking a shot with fifteen minutes left in the second period. This was the Bruins' first win against St. Louis in Boston since 2001. It also extends Boston's current winning streak at the TD Garden to six games. Tuukka Rask earned his first shutout of the season and was clearly the night's MVP stopping all 33 shots he faced.